Marcel W. Fodor's journalist colleagues typically used superlatives when describing him. For example, John Gunther, who worked closely with him in Vienna during the early 1930s, wrote that "he has the most acutely comprehensive knowledge of Central Europe of any journalist I know." According to George Seldes, Fodor was "one of the best journalists in the world." Even one of America's most famed journalists, Edward R. Murrow, called Fodor "one of the greatest reporters I have ever known." 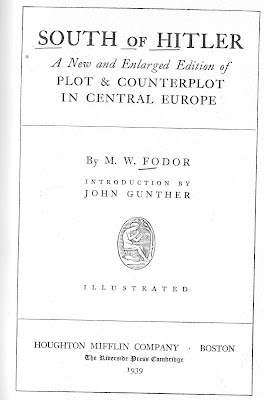 The reasons for the praise of Fodor's reporting is evident in his books, Plot And Counterplot In Central Europe: Conditions South Of Hitler and South of Hitler. The first book was published in late 1937 before the German-Austrian Anschluss. The second book, South of Hitler, was published in early 1939; its contains, unaltered, all Plot and Counterplot chapters, plus three new chapters on the tumultuous events of 1938. Fodor's vast knowledge of Central Europe and the Balkans is displayed in these books. 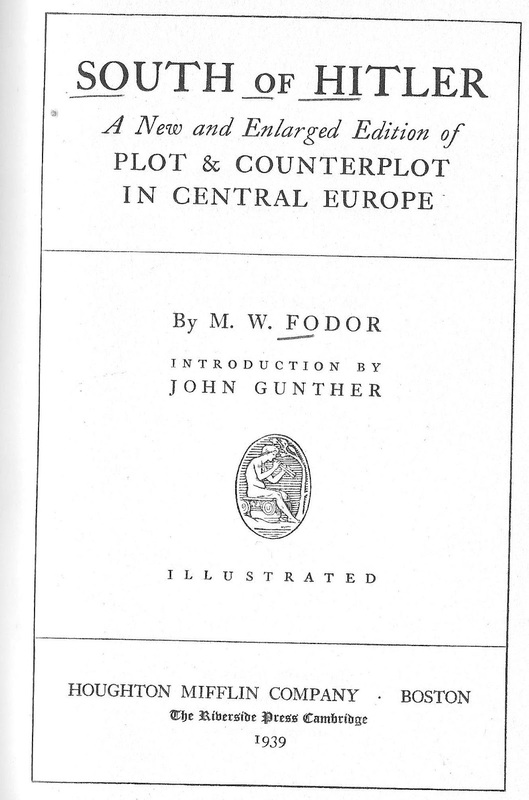 They were positively reviewed at the time of their publication, with reviewers often in awe of Fodor's command of a vast array of facts about the recent past and the prospects in 1937 of the eight countries that he covered, including Albania, Bulgaria, Yugoslavia, Czechoslovakia, Greece, Turkey, Hungary, and Austria. Much of the books concern the situation in the last two countries. The revealing details in South of Hitler came largely from Fodor's seventeen years of closely following events in Central Europe and the Balkans as a correspondent for the Manchester Guardian and several papers in the United States. They also reflect his strong ties to Central Europe. Fodor was born (1890) and raised in Hungary. His father, Janos, was a rich Budapest industrialist who had changed his name from Fischer to Fodor during the Magyarization movement in the last part of the 19th century. Among his holdings, he owned a newspaper in Budapest and in Vienna. Fodor's mother, Bertha von Auspitz, came from a fabulously rich family in Brno, then known as Brünn. As a member of this affluent family, Fodor was well educated in his youth and learned several languages. He mentioned in South of Hitler (p. 188) that he first traveled throughout the Balkans in 1905 when he was 15, accompanied only by a 12-year-old nephew. Though a person with broad interests, Fodor studied chemical engineering at the University of Budapest and the Technical College in Charlottesburg (now, part of Berlin), earning a degree in the field in 1911. After that, he informally studied art in Zurich and Paris. Fodor's first job, in 1913, was at an Iron and Steel Works in Frodington, England. According to his son, Denis Fodor, Marcel's father helped him get an engineering position at this plant, which was owned by Hungarian investors, so that he — a pacifist — could stay out of the Austro-Hungarian army. When World War I came, Fodor was interned as an "enemy alien" in Great Britain, but soon after its end, he returned to Budapest. As described in South of Hitler, Fodor's journey home took him first in January, 1919, to Berlin, where he witnessed the Spartacus uprising, then by train to Munich, where the communist revolt was taking place. On his train ride from Munich to Salzburg, he watched the desperate cross-border smuggling of food to help supply starving Austrians. Foregoing his training as an engineer, Fodor got work as a reporter for the Manchester Guardian, a liberal British newspaper, in 1919, plus that year he did volunteer work as a Quaker for the Society of Friends in Budapest. In 1921, when he was living in Vienna, he was appointed to be a full correspondent for the Guardian. In his role as a Manchester Guardian reporter, then correspondent, Fodor traveled extensively in the huge territory he was covering for the paper. From 1919 through 1937, he repeatedly interviewed political leaders and others making news in all of the countries on his beat. He augmented the knowledge obtained from his trips with information from regional news services; with facts, tips, and rumors obtained from tipsters, spies, and others who hung out at Vienna's Cafe Louvre; and with interviews of prominent people from the region who visited Vienna. We can see a large sample of his encyclopedic mind in South of Hitler. It is crammed with long-forgotten names, places, and events that were part of the mosaic of regional politics at the time. For example, the book includes the history of numerous treaties that were made and broken as countries tried to counter threats from Italy or Hungary or Germany through alliances with neighbors. If you want to know the details of the Little Entente and its evolution, you can find them in South of Hitler. Fodor's ability to keep facts about Central Europe and the Balkans at his fingertips was noted in his obituary published in the New York Times on July 1, 1977. After mentioning that Fodor spoke five languages fluently, the obituary stated: "In his old age he could on request name the deputy police chief in Vienna at the time of the Nazi assassination of Engelbert Dollfuss in 1934." Fodor was not only able to assemble intimate, detailed knowledge of who did what and how in the countries he covered, he also went beyond the facts to analysis and prediction. He used his vast store of facts, opinions, rumors, and assessments to try to make sense of the political dynamics of Central Europe and the Balkans and to project what was likely to happen in the future. South of Hitler is full of his analysis and predictions. In comparing Fodor to some of his more famous friends and colleagues, he falls short on one aspect of his work: he did not write as fluidly and interestingly as some of them. After all, English was not his first language, and he had the mind of an engineer, not a novelist. His prose is rational and competent, not dazzling. Likely Fodor's rationalistic prose and modest personality contributed to the fact that he did not achieve the fame that came to three fellow journalists he met and worked closely with in Vienna. He was a mentor of two of them: Dorothy Thompson and John Gunther. He was friends with the third, William Shirer. All three became renown journalists in their post-Vienna days. 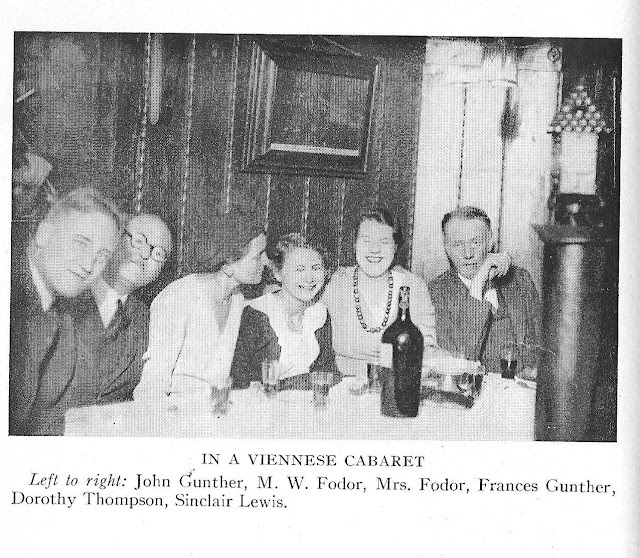 Fodor met Thompson in 1921, when she was just starting to work in Vienna as a journalist. She was a prolific, facile writer with boundless energy and strong opinions. She had quick success as a reporter and later became a widely read nationally syndicated columnist. Gunter came as a young man in 1930 to Vienna. A would-be novelist whose talent lay in telling rich "people" stories, he parlayed the knowledge he gained as a reporter, his interview skills, and his narrative writing abilities into the bestselling "Inside" books. Shirer was a Chicago Tribune correspondent in Vienna from 1929-1932; he returned for a few months in 1937 and 1938 as a CBS radio correspondent. 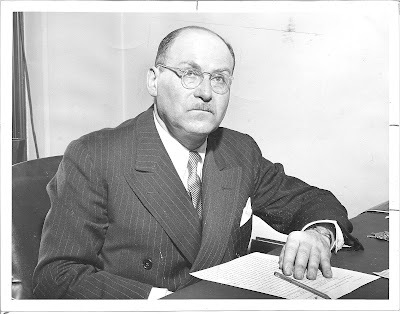 Shirer's Berlin Diary, a passionately written account of his job as a radio correspondent in Nazi Berlin prior to the start of World War II, was a best seller in the early 1940s. In the 1950s he wrote a massive history of the Third Reich that also became a best seller. Though Fodor lacked the writing sizzle and outsized ego of these talented and successful correspondents, he surpassed them in other ways. He had an unparalleled memory for facts and superior analytic talent: He could make connections and draw conclusions from the huge matrix of facts that he had assembled. In addition, Fodor's language skills enabled him to interview a much broader array of interesting people in their own language. Given Fodor's strengths and weakness as journalist, the value and power of South of Hitler — as might be expected — lies in its deployment of facts and its analysis of their meaning to better understand events occurring in the late 1930s. Sometimes, South of History gets a bit bogged down by the huge array of characters and happenings that appear in the narrative, but they all are pixels in the larger picture of important developments in Central Europe and the Balkans during the first part of the 20th century. If a reader would like to immerse him- or herself in understanding people and events in this area during the 1920s and 1930s, this book cannot be beaten. Thank you - this is the best info I´ve found on Marcel Fodor. I'm reading Shirer´s Berlin Diary, and just had to learn more. Thank you for your comment. I'm still doing research on M.W. Fodor and hope to go through Shirer's papers at Coe College archives this spring to find out more about their relationship. I have read most of Shirer's autobiographic books and enjoyed them (except for his mean-spirited End of Berlin Diary published in 1947). He lived through interesting times and documented them well. Fodor's story is an rich one that is documented mainly by his friends Dorothy Thompson, John Gunther, Friedrich Sheu, and Shirer, plus Fodor's books and articles. Thank you - this is the best info I´ve found on Marcel Fodor. "From 1912 [not 1913] he worked at the Frodingham [not Frodington] Iron and Steel Company in Scunthorpe, where he established a research laboratory, and rose to the position of assistant manager of the melting department, but war was to interrupt his developing industrial career, being interned as an enemy alien on the outbreak of the First World War. He was released in March 1917, carrying out ‘important war work’ on the estate of Lord Mowbray at Allerton, near Knaresborough. He returned to Hungary in 1919 on his father’s death, when he tried, largely unsuccessfully, to salvage something of the family’s fortune; his mother became a victim of the Béla Kún regime, dying in April 1919." Fodor was from a Jewish family (Fischer) which went through the same Magyarization process as the family of Michael Curtiz (born Kaminer), born two years earlier and also Jewish.